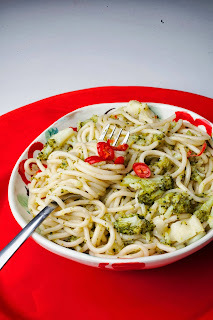 Pasta is one of my favourite weekend dishes - for lunch or dinner. It's quick, fresh and easy and this recipe from Tanya Bartolini uses simple, tasty ingredients. Tanya says, "I often cook this at home. Similar versions are found in many Italian cookbooks but it was a long-time friend (and this book’s photographer) who inspired me to include this here. Many years ago, we sat at school discussing what type of pasta and pasta sauce we preferred. I remember her telling me it was her mum’s spaghetti with broccoli. I was surprised: not many kids say they love broccoli. I was also intrigued. Many years later, when I was trying to work out a different way to use broccoli, I remembered that conversation. This is the result." If you're cooking this one for kids, simply leave out the chilli. 1. Prepare broccoli by cutting it into tiny florets small enough to fit into your mouth in one bite. Use the entire broccoli, including the stem. 2. Fill a large pot with tap water to the ¾ mark. Place the pot onto a high heat and bring water to the boil. When the water is boiling, add 1 tablespoon of cooking salt, the dried pasta and broccoli. Stir to ensure that the pasta does not stick to the pan or itself, and bring the water back to a rolling boil. 3. Whilst the pasta is cooking, fry garlic and chilli in olive oil over medium heat in a large frying pan for about 30 seconds. Turn off heat and leave the pan on the stovetop. 4. Continue to cook the pasta and broccoli until the pasta is cooked through. Use a coffee mug to reserve a cup of water when draining. 5. Tip the broccoli and pasta into the frying pan along with half of reserved pasta water. Turn the heat to medium/low and toss the pasta through the liquid, chilli and garlic. Cook for 1 minute or until combined. Transfer to a large serving bowl. Tip: Tanya advises serving this with some grated lemon rind on the pasta, for a lovely fresh taste. Grated parmesan cheese is also an essential. To mix it up a bit, you could also add some ham, bacon or chorizo - YUM!